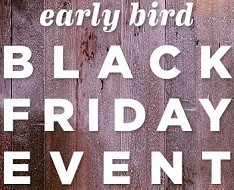 Early Bird Black Friday Event 2015 from Old Navy is on. Take the chance and start saving money! Receive 30% discount on your entire purchase. You can make thet 40% discount when you spend $100 or more. Offer is valid online only. To receive the offer use promo code EARLYBIRD. Offer expires 11/25/2015. Source of the information is Old Navy. More details available online on the official website.